Hubby & I have decided that the culinary theme for this year, well what we want to learn how to do properly, is preservation. Be it jams, alcohol or pickles. So this weekend we’ve had a big spring clean. Hubby has been busy in the outhouse cleaning it out, putting up shelves, getting rid of rubbish and some frankly dire nettle beer, installing some better lighting, painting it white to make it seem brighter and making Bushel boxes. He has decided to name little project River Shed HQ. Over the next few months we’re hoping to fill the shelves with various items and if they go well, blogging them on here. After making the scouse last week and eating it with pickled red cabbage I had forgotten how much I like red cabbage, in all it’s different forms. 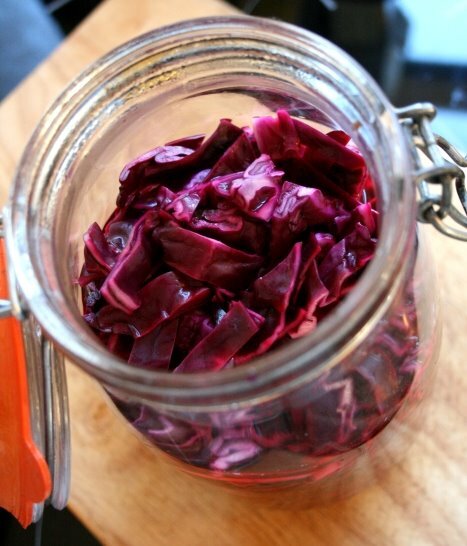 So my first 2009 preserving project became pickled red cabbage. I’m looking forward to trying it in a few weeks once it is ready. 1) Quarter the cabbage, remove the heart and shred the leaves. 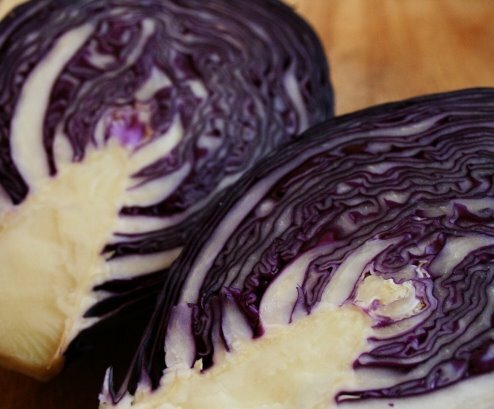 Layer in a dish with a generous sprinkling of salt between each layer or cabbage. Leave for 24 hours. 2) In a aluminum/copper free saucepan heat the vinegar and pickling spices (don’t allow to boil). Take off the heat, cover and allow the spices to infuse for at least 2 hours (I did it over night). 3) Once the vinegar has infused, filter through a piece of kitchen paper or coffee filter. 4) When the cabbage is ready, drain then rinse the cabbage thoroughly in cold water to rid of the salt. Pack the drained cabbage into a clean jar and cover in the spiced vinegar. Over the last month I’ve been tagged twice by Hayley and Victoria Plum. So here are the 6 facts about me. 1. I had a picture in the HartBeat gallery at the grand old age of 6 3/4 (the 3/4 is very important when your 6). For appearing in the gallery I was sent Tony Hart’s autograph and some book tokens. I still have the book and his autograph. This morning the sad news was announced that Tony Hart had passed away. RIP Tony. 2. I love vintage women’s fashion and have a collection of dresses and swimwear dating from the 1930’s. 3. If I had room I would expand my collection of vintage cookbooks and kitchenalia. 4. I’m a big musicals fan…Hubby doesn’t share my enthusiasm! 5. For me, nothing beats climbing a mountain/hill and admiring the view. 6. I’m lost without my handbag.